Wonderful white painted rustic wooden deckchair for small dolls. We recommend this for slim dolls of between 21-30cm. Wonderful white painted rustic wooden deckchair for small dolls. We recommend this for slim dolls of between 21-30cm. Perfect for Mini Kidz 'n' Cats, small Fun In Faith, Heidi Plusczok, Boneka and Vestida de Azul Carlota dolls. 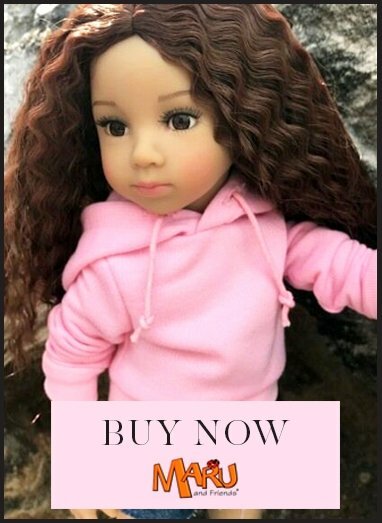 It is unsuitable for wider dolls of the same height. Upholstered in a nautical beige canvas with blue shelf printed detail. Folds flat for storage, and is mini but otherwise just like a full size deckchair! Please note this is a 'rustic' item and is finished to this weathered look standard. Expect paint imperfections and enjoy it for the cute, useful, inexpensive and unusual item that it is. Suitable for age 14+ and collectors.